James Byron Hobson, age 81, of Ocala, FL passed away peacefully on Wednesday, March 16, 2016 surrounded by his children. He was born in St Louis, MO on June 10, 1934. Jim and Beverly retired to Ocala, FL and built a house at the Country Club of Ocala, where they would spend the rest of their lives. Jim loved the rolling hills of Ocala, with all its horse farms, which served as a reminder of his upbringing in Kentucky. While Chronic Fatigue Syndrome would contribute to multiple ailments in his life, it could never dull his indelible spirit. He enjoyed golfing, sailing, fishing, and dining out with friends. Jim was known for his intellect, quick wit, and humor, and could be found often entertaining and laughing with friends on his lanai. He was a devout Christian, and spent much of his time helping others. He is survived by his son Byron and his wife Alicia Hobson of Millsboro, DE (formerly of Boston), daughter Melody Sneden of Dunstable, MA and 2 grandchildren Nicholas and Joshua Sneden and a sister Cindy Zaukas of Kingswood, TX. He was preceded in death by his wife of 52 years Beverly Looper Hobson. 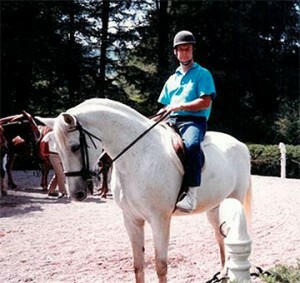 In Lieu of flowers, it was Jim’s wish that memorial contributions may be made to Marion Therapeutic Riding Association, so we have established this donation page to honor his request. Thank you to everyone who contributes, your donations will insure that MTRA continues their work here in Ocala for years to come.